A little over two years ago, the Glory team travelled to Shkoder, Albania to watch Kosovo play their first ever competitive home match. That game ended in a comprehensive 6-0 defeat at the hands of political allies and near-neighbours Croatia – a side that would go on to finish as runners up at Russia 2018. Given the context of that game, the result was always likely to say more about the visiting Croatians than it did about the home side. The two nations have trod vastly contrasting paths since then. Croatia scaled unprecedented heights, but closed out their 2018 with relegation to League B of the inaugural Nations League. Kosovo, meanwhile, played some scintillating football as they topped their Nations League group to secure a Euro 2020 playoff spot. And on Sunday, Fifa’s newest member nation was placed in Euro 2020 qualifying Group A – alongside England. For Glory, the Kosovo story will have come full circle when Kosovo take to the Wembley turf next year. But let’s go back to that stormy night in Shkoder for a moment. Kosovo was alight with excitement, but the thrill of a competitive home debut was undercut by the myriad problems facing the team. For starters, the game was being played in neighbouring Albania – as Kosovo lacked a stadium that met FIFA’s exacting tournament standards. The makeup of the team itself was uncertain too, with many Swiss, Albanian and other players of Kosovar heritage signalling their intention to play for Kosovo – only to be denied at the 11th hour by FIFA. No-one could say with confidence what Kosovo’s first team was going to look like, and coach Albert Bunjaki had precious little time to prepare with his favoured players. Kosovo were comprehensively outplayed by their Balkan guests, and the emphatic scoreline tempered some of the fans’ enthusiasm. The scale of the task ahead of them was laid bare by a Croatia team missing Luka Modric, Ivan Rakitic and Dejan Lovren. But Kosovo bent to that task. The chance to qualify for Russia 2018 came and went, as it was always likely to do. Bunjaki was replaced by Swiss coach Bernard Challandes, and some of the nation’s promising young starlets began to apply their talent more consistently on the pitch. In the likes of Milot Rashica and Arbër Zeneli, Kosovo have a forward line of considerable potential. Under Challandes’ stewardship, the Nations League D became a stroll for Kosovo. This side delivered comprehensive evidence that they are a cut above the likes of Azerbaijan, Malta and the Faroe Islands. But have they found their level yet, or is there more to come from this exciting young side? Thanks to the Nations League, Kosovo now have two bites of the cherry to qualify for their first international tournament at Euro 2020. Two teams will graduate from qualifying Group A, and with matches against the Czech Republic, Bulgaria and Montenegro to come, Kosovo have more than a fighting chance. In Glory Issue 2, I wrote that “Kosovo's football story is the most compelling of all right now”. If Challandes’ men make it to Euro 2020, the next chapter of that story may prove even more fascinating still. Glory Issue 2 documents the incredible story of Kosovo – Europe's youngest football nation. 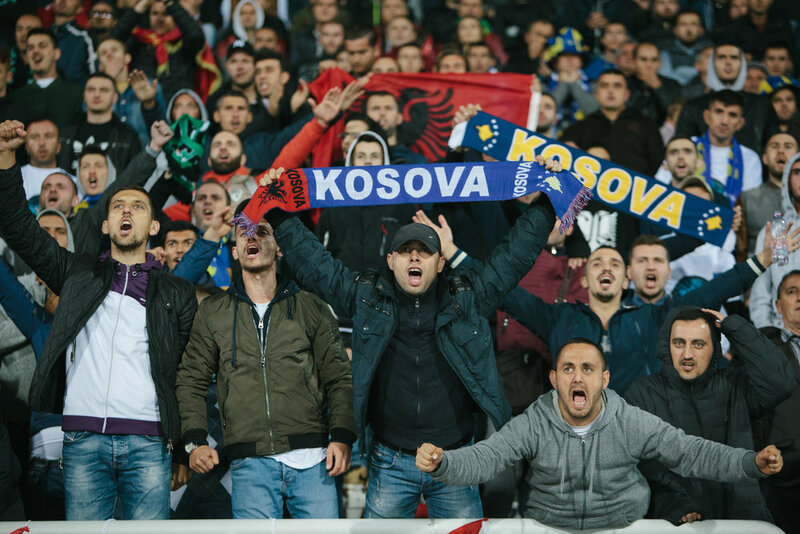 We watched history in the making as Kosovo took part in their first ever competitive home game, met the die-hard Dardanët supporters group and explored football culture in a region rocked by war. We looked at Kosovo's celebrated diaspora, and imagined the spectacular Kosovar national team that might have been. And we caught up with two Kosovar clubs sides – KF Liria and KF Gjilani – to learn about their troubled histories and plans for a better future. This limited edition journal features award-winning writing, photography and design. Find out more about why we chose Kosovo for our second issue.